Creamer Media's Energy Roundup is a monthly report providing a synopsis of energy-related news from South Africa in the past month. 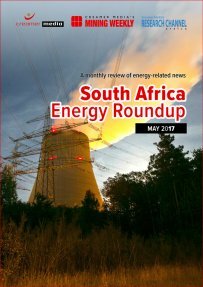 The May 2017 roundup covers activities across South Africa in April 2017, and includes details of the Council for Scientific and Industrial Research’s formal input into the Integrated Resource Plan public consultation process; the Western Cape High Court’s ruling on government’s controversial nuclear power expansion programme; and Public Enterprises Minister Lynne Brown’s rejection of State-owned power utility Eskom’s board proposal to grant former CEO Brian Molefe a R30‑million pension payout. The report is a summary of information published in Engineering News and Mining Weekly, as well as of information available in the public domain, and does not purport to provide an analysis of market trends. Published on: 04 May 2017.